Eleven MVCTC Business Professionals of America (BPA) students qualified at the recent State BPA Contest to attend the National Conference in Anaheim, CA, May 1-5. Pictured, left to right, are Caleb Boyd (Computer Network Engineering student from Miamisburg), Kyle Saul (Computer Repair and Technical Support student from Twin Valley South), Olivia Keihl (Business Ownership student from Arcanum), Ashley Hunziker (Business Ownership student from Northmont), Delany Norton (Business Ownership student from National Trail), Keleigh Vogel (Business Ownership student from Valley View), Jacob Roesle (Computer Network Engineering student from Tri-County North), Jahcorian Ivery (Computer Network Engineering student from Trotwood), Cylas Whiting (Game Programming and Web Applications student from Miamisburg), Chloe Holicki (Medical Office Management student from Miami East), and Thane Class (Game Programming and Web Applications student from Twin Valley South). 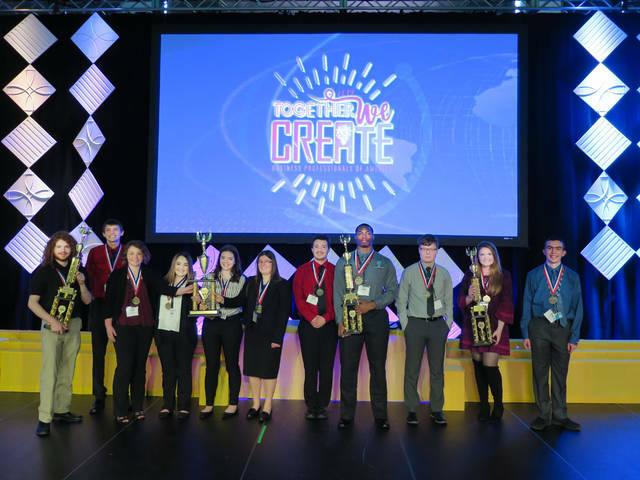 ENGLEWOOD — Miami Valley Career Technology Center (MVCTC) Business Professionals of America (BPA) students qualified at the recent State BPA Contest to attend the National Conference in Anaheim, California, May 1-5. The following MVCTC students qualified to compete at the National BPA Contest. • 1st place in the Ohio BPA Computer Network Technology Contest- Caleb Boyd, Computer Network Engineering student from Miamisburg. • 1st place in the Ohio BPA Global Marketing Team Contest – Business Ownership students Ashley Hunziker (Northmont), Olivia Keihl (Arcanum), Delaney Norton (National Trail), and Keleigh Vogel (Valley View). • 2nd place in the Ohio Medical Office Management Contest – Chloe Holicki, Medical Office Management student from Miami East. • 2nd place in the Ohio Systems Administration Using Cisco Contest – Jahcorian Ivery, Computer Network Engineering student from Trotwood. • Top Five in the Ohio Java Programming Contest – Thane Class, Game Programming and Web Applications student from Twin Valley South. • Top Five in the Ohio Systems Administration Using Cisco Contest – Jacob Roesle, Computer Network Engineering student from Tri-County North. • Top Five in the Ohio Database Applications Contest – Kyle Saul, Computer Repair and Technical Support student from Twin Valley South. • Top Five in the Ohio C++ Programming Contest – Cylas Whiting, Game Programming and Web Applications student from Miamisburg. https://www.registerherald.com/wp-content/uploads/sites/41/2019/03/web1_2018-2019-BPA-National-Qualifiers-1-_ne2019324191259215.jpgEleven MVCTC Business Professionals of America (BPA) students qualified at the recent State BPA Contest to attend the National Conference in Anaheim, CA, May 1-5. Pictured, left to right, are Caleb Boyd (Computer Network Engineering student from Miamisburg), Kyle Saul (Computer Repair and Technical Support student from Twin Valley South), Olivia Keihl (Business Ownership student from Arcanum), Ashley Hunziker (Business Ownership student from Northmont), Delany Norton (Business Ownership student from National Trail), Keleigh Vogel (Business Ownership student from Valley View), Jacob Roesle (Computer Network Engineering student from Tri-County North), Jahcorian Ivery (Computer Network Engineering student from Trotwood), Cylas Whiting (Game Programming and Web Applications student from Miamisburg), Chloe Holicki (Medical Office Management student from Miami East), and Thane Class (Game Programming and Web Applications student from Twin Valley South).